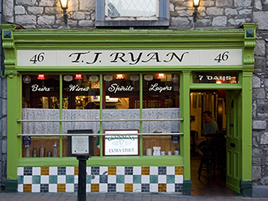 A Traditional Irish Pub established in the 17th Century. The pub is warm and cozy with an open fire and old world charm together with friendly and helpful staff to ensure you enjoy this traditional pub’s unique atmosphere. Light food, coffee and a variety of teas are served throughout the day while it also caters for functions and parties providing finger food and music. T.J.’s pub carries a large selection of top end Whiskeys and Gins. Free Wi-fi is available so you can browse the internet while enjoying a drink or carry out quick business meetings in a pub that lends itself to privacy. Sky Sports and Racing channels are available to allow you follow the sport of your choice.